FitnessMAD™ - Veiligheidsweerstandband - Medium - Blauw - Body Works fitnessgroothandel met 1800 Sportmateriaal, Fitnessproducten en gezondheidsproducten uit voorraad. This is the second lightest Fitness-Mad Safety Resistance Trainer and is ideal for those familiar with resistance training. Supplied with a 12 page A5 resistance training and usage guide covering 19 key resistance exercises for a total body workout. 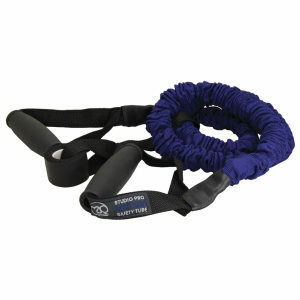 Also includes a door attachment that enables you to turn the Resistance Trainer in to a workout anywhere gym. ;Our Studio Pro Safety Resistance Trainer ;offer a safe alternative to latex resistance tubes without compromising performance. The proection sleeve virtually removes the risks associated with latex tube failure and also extends the life of the latex tube.